Oct. 1, 2018 marks the 69th anniversary of the founding of the People's Republic of China. 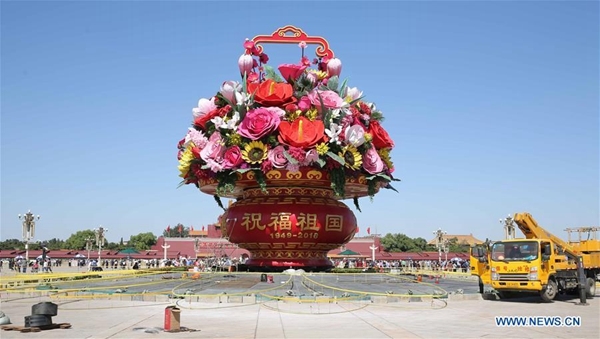 It was on this date that Chairman Mao Zedong had declared the establishment of a new China on Tian'anmen Square. Subsequently, on Oct. 2, 1949, China's new government passed the Resolution to celebrate October 1st as the National Day. The initial two decades after its founding, China witnessed several ups and downs. The first five-year plan resulted in a significant improvement in the quality of national industrialization. After years of instability, a sustainable period of economic development began in 1978 when Deng Xiaoping realized that economic growth could be accelerated by boosting the export volume and introducing new incentives. To achieve this, he set up several Special Economic Zones in China. These zones attracted huge foreign investment, new technologies and management ideas, which helped them boost their export volume. In addition, new incentive systems were introduced to improve labor productivity. Peasants were also allowed to sell surplus agricultural yields in the open market and rural markets where homegrown products could be sold were revived. These activities increased the domestic consumption, stimulated industrialization, and built a domestic political base for the implementation of more challenging reforms. The next step China took was to join the World Trade Organization in 2001. This propelled it further and China started receiving benefits such as the lowering of tariffs, and it enjoyed a level playing field as a favored nation. This allowed China to boost its trade volume and develop global competitiveness in numerous high-tech products. China, in the last four decades - with a year-on-year GDP growth of around 10 percent - has transformed from an agrarian economy to the world's second largest economy after the U.S. During this period, the country's per-capita income increased almost 40 times from $155 in 1978 to $7,590 in 2014. In the past few years, China has moved toward expanding its reach and creating a global impact instead of limiting itself to its own national boundaries. To achieve its plans of improving land connectivity, sea connectivity, and cooperation along the historical Silk Road, China has initiated the construction of the Silk Road Economic Belt and the Maritime Silk Road. These routes will connect countries from Central Asia to Europe and South Asia to Africa and the Middle East. This initiative has been a major focal point in China's foreign policy since it was announced in 2013. In spite of its rapid growth, China faces its own set of challenges such as high income disparity, environmental issues, trade imbalances, and a rapidly aging society. Significant adjustments in existing policies are required in order to deal with these problems; failing which China could potentially fall into the middle-income trap. The 13th five-year plan from 2016-2020, however, addresses some of these issues such as reducing environmental and social imbalances, improving energy efficiency, and providing access to education and health-care. The annual growth target during this period is a more sustainable 6.5 percent, reflecting the re-balancing of the economy from being investment-led to consumption-based. The main focus is on maintaining the quality of growth while still fulfilling the objective of achieving a moderately prosperous society by 2020. So far, it seems that China, in spite of the ongoing trade tensions with the U.S., will continue on its upward trajectory. However, only the future will tell whether these plans deliver their expected results. Although there is a potential chance of prolonged trade frictions with the U.S., China certainly has the capacity to overcome this challenge and evolve as a stronger nation than ever before. Rachana Gupta is a China Focus columnist, an expert author of Ezine Articles and an active blogger and poetry writer. China has made prodigious economic and social strides since the 1950s, but seeks more reform as it takes to the next chapter of development.